This article explores how manufacturing facilities can create a balanced approach to maintenance using a combination of different preventive maintenance methods, solutions, and best practices. 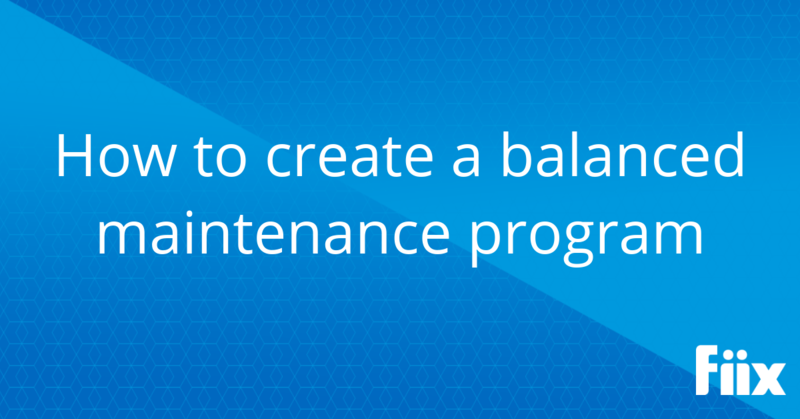 How do you create a perfectly balanced maintenance strategy? Balance is important to every part of life. Having too much of any one thing can lead to major consequences, even with the best of intentions. A diet that’s too strict leads to binging, working out too often results in injury and being a workaholic risks burning out. Balance is also very important when we talk about maintenance strategies. Relying on a single strategy for every scenario can lead maintenance teams down a dark path. You likely already know the downside of too much reactive maintenance, but even too much preventive maintenance can have its downside—like spending time and money carrying out unnecessary repairs. At the end of the day, it takes a balance of different methods to create the most effective maintenance plan. By combining strategies into the perfect blend, maintenance teams can prevail over challenges like unplanned downtime, backlogs, communication gaps and spiralling costs. Once a complete, planned maintenance strategy is in place, managers and technicians can decide how to increase asset reliability by using time, money and other resources more efficiently. We examined the three most common maintenance practices used to create a balanced maintenance program. Preventive maintenance is maintenance that is regularly performed on a piece of equipment to prevent failure and unexpected downtime. Equipment checks are triggered based on time, meter reading, or usage so that maintenance is performed while the asset is still working (rather than after it’s broken). For example, a facility might use CMMS software to be notified when to clean and lubricate a conveyor belt after 100 hours of use, or after 10,000 units have passed through it, so the conveyor belt doesn’t break down unexpectedly. When used correctly and in balance with other strategies, preventive maintenance can help teams plan as much as possible to improve reliability and spend their time and money in areas where they will do the most good. Want to learn more about preventive maintenance? Check out our Short Guide to Preventive Maintenance. It may sound counterintuitive, but reactive maintenance and run-to-failure (RTF) maintenance can be part of a healthy approach to planned maintenance. With this strategy, assets are deliberately allowed to operate until they break down, at which point they are repaired or replaced. To successfully integrate reactive and RTF maintenance into a complete maintenance program, you must know exactly which assets are affected and have a plan in place so work can be done without major disruptions. For example, if a machine is involved in continuous, 24/7 production, shutting it down for monthly maintenance would create more disruption than if it were allowed to break down on its own (say, once a year). The key to integrating run-to-failure maintenance into your overall strategy is twofold. First, it should only be applied to equipment that won’t significantly impact operation if it goes offline. Secondly, it’s important to have a system in place, like CMMS software, so you can ensure the right parts and resources are accessible for quick and effective repairs. Balance is very important when we talk about maintenance strategies. Relying on a single strategy for every scenario can lead maintenance teams down a dark path. While your maintenance team might want to completely rid themselves of reactive and RTF maintenance, this strategy can reduce unnecessary stress, labour, downtime and costs when employed properly and in conjunction with other methods. The aim of predictive maintenance is to predict when equipment failure might occur and prevent the failure by performing maintenance. With PdM, maintenance is only performed when required, which is just before failure is likely to occur. Predictive maintenance allows the frequency and rate of unplanned maintenance to be as low as possible, without incurring costs associated with too much preventive maintenance. For example, a critical machine might be fitted with sensors that collect data on vibration. This data can be processed by CMMS software and used to indicate when there is a problem with an asset, such as misalignment or a loose part. The issue can be located quickly and the asset can then be repaired before failure. When deciding where PdM fits into your balanced maintenance program, you must evaluate the return on investment. It’s important to compare the cost of technology and the level of expertise necessary when deciding between predictive maintenance and preventive maintenance. In some cases, PM or RTF might be more cost-effective, while in other cases it might make sense to leap into a predictive solution. While your maintenance team might want to completely rid themselves of reactive and run-to-failure maintenance, this strategy can reduce unnecessary stress, labour, downtime and costs when employed properly and in conjunction with other methods. How do you create a perfectly balanced maintenance program? These numbers are influenced by a host of different factors. The following are some aspects that should be taken into account when designing a perfectly balanced maintenance program for your operation. Asset type and asset hierarchy: The first step in determining which maintenance method is best for each asset is to review how equipment functions and how important it is to production. Production and reliability: It’s important to consider the amount of time equipment is producing revenue-critical material, the impact of downtime on production, and how long the equipment can function efficiently before failure. Technology and budget: It’s also crucial to consider the quality of technology available to your facility and the financial ability to invest in technology when determining the right mix of maintenance practices. Data is essential when determining which maintenance method is the most cost-effective with certain assets. Mean time to repair (MTTR) and overall equipment effectiveness (OEE) are two metrics that can offer essential information. MTTR is the average time required to repair broken equipment and return it to normal operating condition. With MTTR, maintenance teams can measure the economic impact of unplanned downtime for each asset. We can take our light bulb scenario as an example. The MTTR for a light bulb may be five minutes every month, whereas preventive maintenance may take 10 minutes every month. It’s that RTF is the most time and cost-effective solution. Overall equipment effectiveness (OEE) refers to the availability of equipment, its performance versus specs, and its production quality. Comparing an asset’s OEE percentage in all scenarios (with reactive, preventive and predictive maintenance), allows you to see which method is best for the bottom line. For example, if a car breaks down less and uses less gas when its oil is changed at regular intervals, a preventive maintenance approach is best. Because collecting solid data is crucial to creating a balanced maintenance program, it’s important to make this process easy. This is where maintenance software, such as a CMMS, comes in. Maintenance management software allows users to track key metrics without having to shuffle through stacks of paper or Excel spreadsheets. It also provides a simpler option for running reports and analyzing data, so you can make faster, and better, decisions. No matter where your team is on their maintenance journey, a balanced program is important to achieving the best results. Knowing how to combine preventive, reactive, and predictive into one, highly functioning plan may take a lot of work. But with the help of maintenance software, such as a CMMS, it’s possible to bring these strategies together in harmony. When you can achieve this, your facility will reap the benefits of less downtime, increased production, fewer backlogs and a safer workplace.